Deliver all of this at the best value. Basics; Competencies, Numbers, Principles. Through your Strategic Business Planning process you will have determined the numbers, skills and future requirements. This coupled with your Corporate Vision, Mission and Values will provide sufficient information to move forward. Utilization of outside resources – Staffing firms, recruiting firms, consultants, etc. A portion of every employee’s role; campus visits, tour guides, interviewing, etc. All of these decisions are critical and most will have already been made when you started to develop your Talent Management Process (See Blog #1). Getting Started As we reviewed in the Workforce Planning blog, the steps are easy, the decisions are not. Now that you have hired the best employee you need to develop and train them quickly and efficiently. The next blog will discuss how organizations optimize employee contributions through Training and Development. Click on the following link to complete this simple HR Self-assessment. The free self-assessment takes only a few minutes and your results will be sent to you immediately along with information on how your company stacks up against benchmarked best practices. 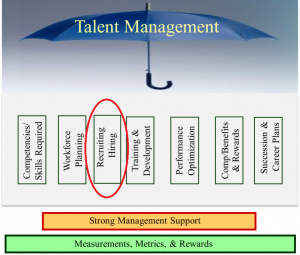 You can read the rest of our series on Talent Management here. About the author: Bruce Dougan is the head of Group50’s Organization Design and Development Practice. Bruce and the Group50 team are all former executives with well-known manufacturing and distribution companies who understand what it takes to design, train, develop and motivate organizations to successfully implement a company’s strategic plan. Group50 Exit Planning Consultants has designed a series of strategic assessments, workshops and strategic execution tools that optimize your organization. You can reach us at (909) 949-9083 or send a note to info@group50.com.